[DLF], or Droid Life’s Favorites, is a series of articles reviewing our favorite apps in a given category. The goal of these articles isn’t to extensively review every single option out there and determine which is “the best,” but rather to give you a few of our favorite apps in a category. 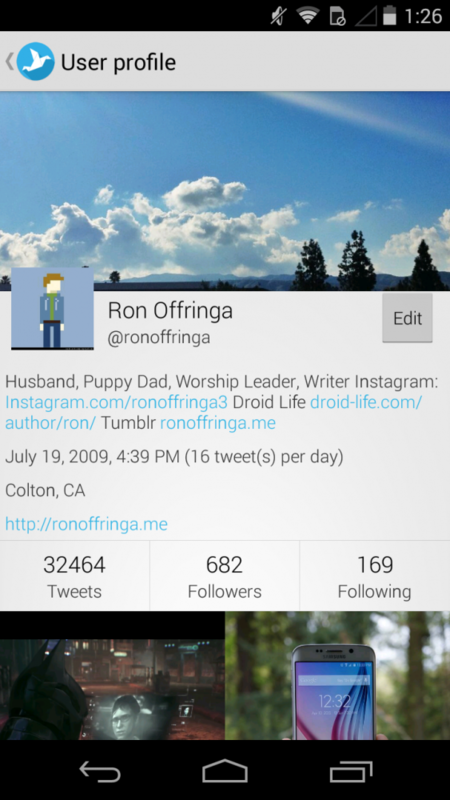 This week we look at Droid Life’s favorite twitter apps. I really love Twitter. I love Twitter so much I bought some Twitter posters to hang in my apartment (you can buy them here). 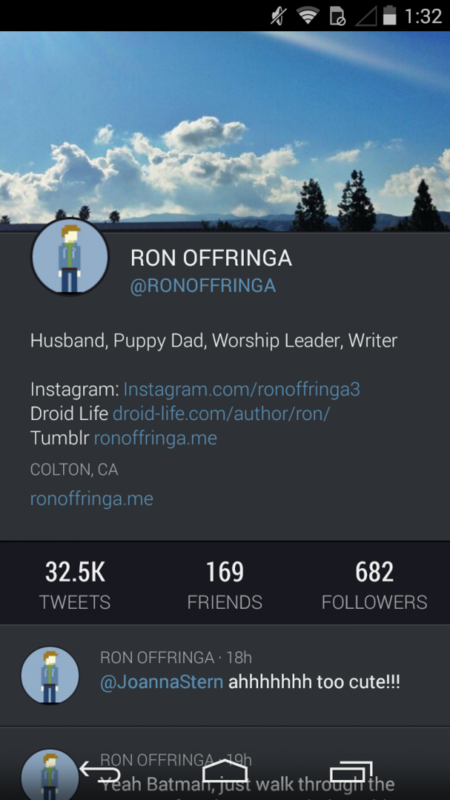 There are a lot of Twitter apps out there for Android, but these four are my favorite. Tweetings for Android is my absolute favorite Twitter app for three main reasons: it has real push notifications, it has a beautiful parallax preview type for inline media, and it has a distraction-free reading view. Real push notifications are a big deal. When someone follows me, or replies to me, or sends me a DM I want to know right away. There are other third party apps out there that offer push notifications, but they’re usually implemented in a way that drains battery on your phone. Tweetings handles push notifications from their servers, so your phone doesn’t have to burn away its battery searching for those notifications. While you’re scrolling through your timeline on Tweetings you’ll quickly notice that images slowly scroll from top to bottom in their preview panes. This isn’t something that will change your life forever, but it is the kind of detail that I love (if you have bad taste and don’t like this you can always change it in settings). Speaking of scrolling through your timeline, something I do all the time is see an article that I might want to read. With Tweetings I have two options: I can tap on the link and Tweetings will load the article with the in-app browser (or the browser of your choice) or I can tap on the tweet and Tweetings will load the article text below the tweet so I can start reading right away in a distraction-free format. I love that second option because it enables me to quickly glance through an article and decide if I want to read it and then shoot it into Instapaper for later. 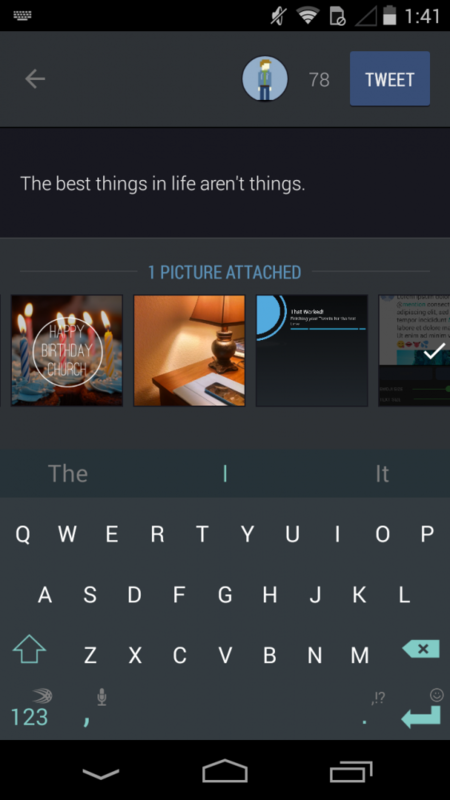 While these are some of my favorite features, Tweetings also has support for GIFs, multiple photos, streaming, quickly selecting the last image in your gallery, themes, drafts, multiple accounts with unified timeline, muting, interactions (notification summary), Twitlonger, and Android Wear. 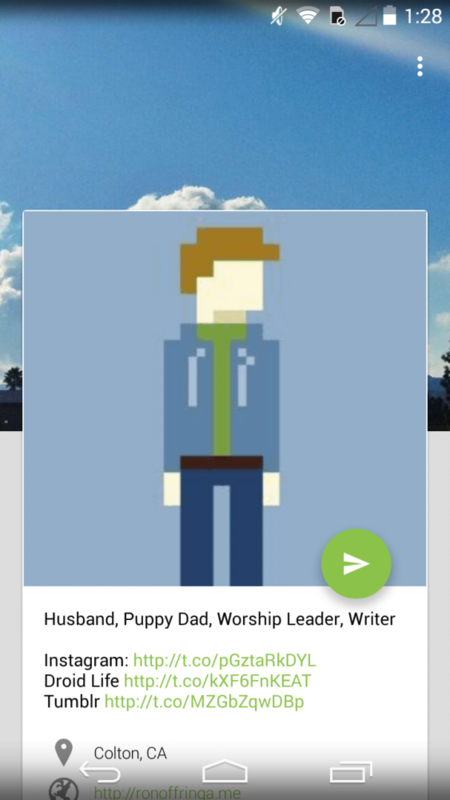 Oh, and of course it has Material design. Tweetings supports Android phones and tablets and even has apps for iPhone, iPad, OS X, and Chrome OS so you can use it almost everywhere. 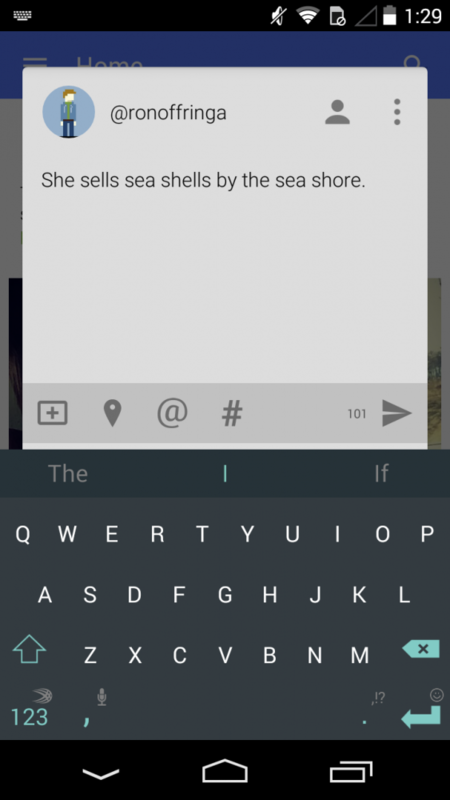 Tweetings is $2.99 on the Play Store. Falcon Pro 3 has come a long way since it launched back in January. When the app launched it felt a little too rushed with basic third party features missing, but the developer, Joaquim Vergès, was quick to add new features to the application. Four months after release updates have slowed, but Falcon Pro 3 has become one of my favorite Twitter apps to use. Falcon Pro 3 has an innovative notification system that is slow to buzz you if you haven’t used the app in a while, but picks up speed as your usage increases. Since Falcon Pro 3 does not have access to push notifications through the Twitter API, this model is undoubtedly designed to save battery life while still offering fast notifications when the app is under heavy use. Personally, I prefer to have push notifications, but I think this is a smart way to work around the limitations in place. Falcon features a landscape mode that displays two columns at the same time on your phone. The text and media previews for each column are responsive so it’s easy to read from either column. I found this feature especially helpful for browsing through timelines on two separate Twitter accounts. Falcon has an interactions menu that serves up a lot of regularly accessed data. Swiping in from the left edge reveals the interactions menu which shows your current follower count, the number of people you’re following, and the number of new DMs you have at the top of the menu. If you have a new follower then there will be a +1 next to your follower count (or a -1 if you lost a follower). Below this top menu is a list of all of your mentions as well as your favorites and retweets. You’re able to view these details on a per account basis by tapping on the appropriate avatar. Falcon Pro 3 features tablet support, Material design, world trends, mute, delete RT, GIF support, scrolling to the top by tapping the top of the column, and many more features. Falcon Pro 3 is free to try with a $3.99 in-app purchase to unlock your first account. Each additional account costs another $1.99 to unlock. Fenix by Matteo Villa is the app of choice for Kellen and Tim. One of my favorite features about this app is the compose gesture. 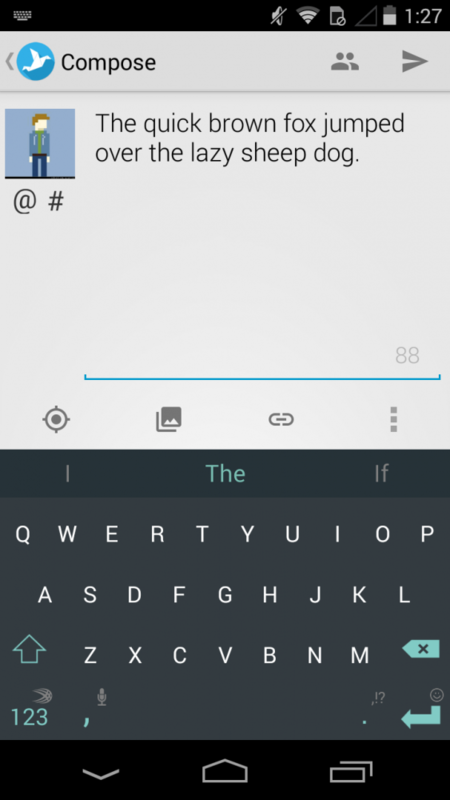 From any column you can swipe in from the right edge to initiate the compose view. 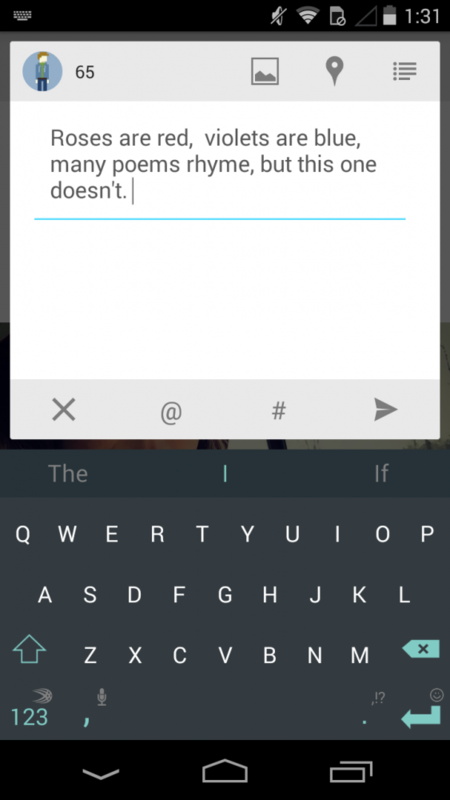 You can, of course, use a traditional compose button if you prefer, but I enjoyed being able to swipe to send a tweet. The main menu is accessed from a swipe in from the left side which lets you quickly jump to mentions, activity, messages, etc. It also allows you to quickly see your lists, add a new list, and view saved searches. Fenix is a well made app with plenty of great features, but I find myself missing push notifications and a medium option for inline media previews. Fenix does make up for push with an option to enable real time updates, but I’d recommend you save this for when you’re on WiFi and feeling careless about your battery life. Fenix of course features GIF support, multiple images in tweets, quickly scrolling to the top of a column by tapping the top, and my favorite, an activity column for viewing all those RTs, favs, follows, and mentions. Fenix is $4.99 on Google Play. 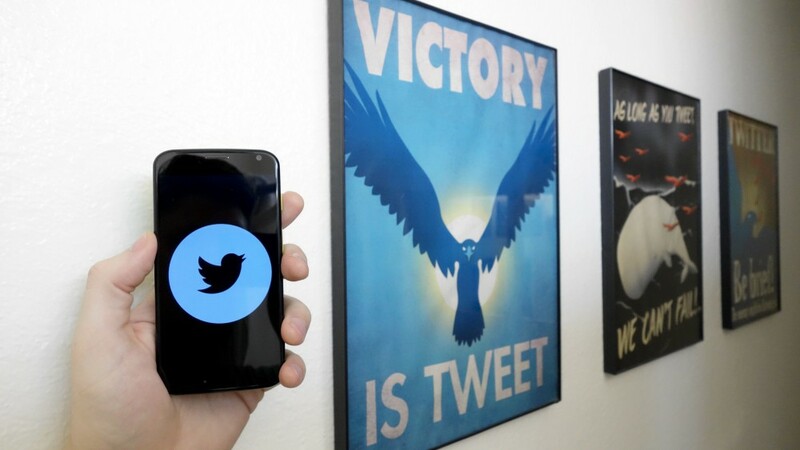 Talon by Klinker Apps is a beautiful Twitter app with Material design. My favorite thing about Talon has to be just scrolling through the app. Once you open the app and it refreshes the column you’re on you’ll see a tally of the tweets you have left to read and a button to jump to the top appear next to the compose button. As you scroll all navigation slides away, allowing you to focus in on the tweets you’re reading. It’s a gorgeous, distraction-free reading interface. Talon also features Talon Pull, a way to work around the Twitter API’s limitations. Pull enables your device to listen for new tweets on Twitter. Not surprisingly, Pull can be hard on battery life (especially on Lollipop), but it at least enables you to keep up with Twitter if you’d like. If you’re a fan of muting, Talon has you covered with a plethora of configuration options. You can mute users, retweeters, hashtags, clients, and expressions. Talon also has a muffled option, which removes the majority of their tweets from your timeline, but still shows you the user and a brief preview so you can decide if you want to see the full tweet from a glance. Talon is $3.99 on the Google Play Store. Third party Twitter app developers are working in a very competitive market with a limited number of clients thanks to Twitter’s hostile attitude towards the developers and community that made it what it is today. While that is frustrating, I still love the service because of the people and the conversations that happen there. Between these four options you should be able to find an app that meets your needs and matches your aesthetic. These developers put in a lot of hard work and it shows. Feel free to share what your Twitter app of choice is and why you like it in the comments.